This new range of System 3 Acrylic Inks from Daler-Rowney offer a great way to add vibrant colour to your mixed media projects. These pigment-based acrylic inks offer vibrant, opaque colour that can can be used with a variety of applications. Ideal for mixed-media they can be used for urban art, airbrushing, card making and most arts and crafts projects. Plus a 1-2mm round Daler-Rowney Mixed Media Paint Marker. 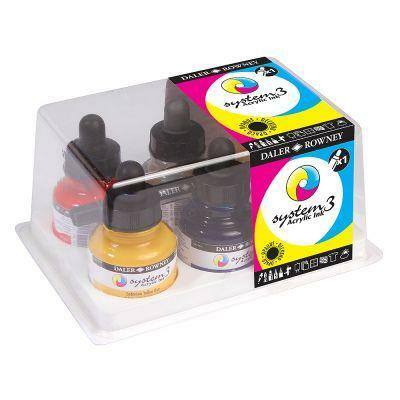 System 3 Acrylic Inks and FW Mixed Media Paint Markers are both available individually.